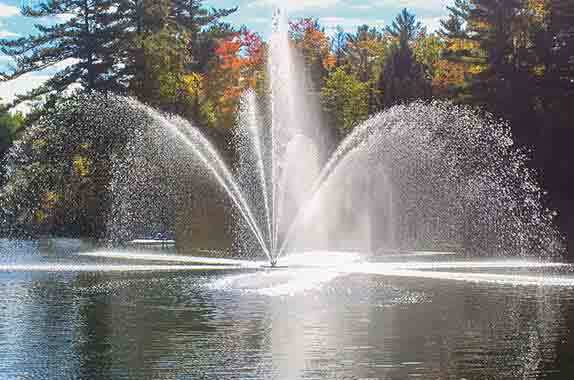 Commercial Fountains, pond aerators and Dock bubblers. Create an aquatic oasis where employees, customers, or guests can congregate and relax. Beautify corporate and resort landscapes with Arbrux floating fountains or aerators to aid in water clarification. Remove ice from around a dock or structure to prevent ice damage with Arbrux dock de-icers/ bubblers. Our variety of safe, high quality, and cost effective products let you achieve the look and result your looking for within your budget. Arbrux floating pond aerators move large volumes of water naturally aerating corporate and resort ponds, removing stagnant water, insects, algae, and foul odors. Arbrux aerators work by propelling water into the air forming small droplets that absorb oxygen which aerates the water cleaning it in the process. Commercial uses for Arbrux aerators include lakes, corporate and resort ponds, and marinas. Arbrux commercial floating pond and lake fountains serve as a resort or building centerpiece to wow customers, guests, and employees while providing aeration to keep the water clean. Arbrux commercial floating fountains come in a variety of sizes ranging from 6 to 46 feet in height, with 6 different spray patterns to choose from there is sure to be a fountain that is perfect for the application. Arbrux de-icers/ bubblers remove ice from around marina docks and structures preventing ice damage. These cost effective units have been proven to last for years to come even in the harshest Canadian winters. De-icers/ bubblers operate by moving high volumes of water from the deeper warmer water to create an ice free opening at the surface of the body of water. Each product is electrically safety tested and listed with ETL to CSA and UL standards. For more information on our commercial line of products contact an Arbrux expert or request a quote today!